Mary-Anne Martin, a native New Yorker, was educated at Smith and Barnard Colleges, and did graduate work at NYU’s Institute of Fine Arts. In 1966 she interrupted her graduate studies to fill in for a month in the Impressionist Department at Sotheby’s New York (then called Parke Bernet Galleries). This led to a thirteen year career with that firm, during which Martin trained as an expert in impressionist and modern paintings, eventually becoming head of their Paintings Department as well as their first female Senior Vice President and officer of the Board. A trip to Mexico City in 1974 kindled Martin’s interest in Mexican Art and in 1977 she organized for Sotheby’s the first auction of Mexican Paintings ever held in the United States. 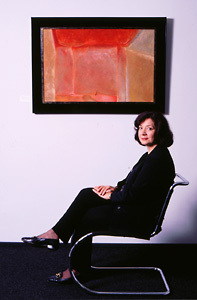 In 1979 she followed with the first auction of Latin American Paintings. The success of this sale led Martin to found the Latin American Department at Sotheby’s, and important semiannual sales of Latin American Art have been held there as well as at Christie’s ever since. In 1982 Martin, noting the absence of private galleries in the United States devoted to the Latin American field, left the auction house in order to found Mary-Anne Martin|Fine Art (mam|fa), a gallery completely devoted to the promotion and sale of Mexican and Latin American Art. Since then mam/fa has become the pre-eminent gallery in the Latin American field. Martin oversees business and public relations for the gallery, supervises publications and develops new business. She works with clients who wish to sell paintings and maintains contacts with collectors and institutions seeking important works. She is known for her connoisseurship and expertise in the Latin American field and consults for collectors, museum curators and auction houses around the world. Martin has served as Senior Vice President of the Art Dealers Association of America (ADAA) and chaired its Membership and Public Relations Committees. She was a founding member of the Selection Committee for Art Basel Miami Beach serving from 2001 through 2010. Deborah Roan received a BA from Cornell University, a BFA from the School of Visual Arts and an MFA from Rutgers. She taught drawing and video production before working as an archivist for the Collection of Dorothy Norman. As Doris Bry’s archivist she prepared art historical materials for deposit at the Beinecke Rare Book Library and organized Bry’s photographic book and print collections for their eventual gift to the photography department at Yale. Her work is represented by Von Lintel Gallery in New York. At MAM|FA Deborah maintains our extensive library of books on Latin American art. She repairs damaged books and manuscripts and develops archival storage systems for photographs and fragile printed materials. She continually adds to and refines the library’s electronic database to allow users to more easily locate materials about the history and evolution of Latin American art. Deborah also does all of MAM|FA’s photography, and maintains the gallery’s photographic archive. Emmaline grew up in Northampton, MA and graduated with honors from Connecticut College with a double major in Art History and Hispanic Studies. She has written arts and news stories for the Daily Hampshire Gazette, interned at the auction house Skinner, Inc., and at the Springfield Museums. Emmaline’s responsibilities at MAM|FA are diverse. She corresponds with clients, researches and catalogues inventory, supervises shipping, maintains our website, composes press releases and e-blasts, and organizes the gallery’s participation in art fairs. Sofia joined MAM|FA in 1996. Born in New York, Sofia spent her early childhood in Nicaragua before moving with her family to Miami when she was five. In 1995 she graduated from Duke University with a degree in Art History. During her senior year she curated an exhibition at the Duke University Museum of Art entitled Patriá: Contemporary Nicaraguan Painting. The exhibition and catalogue were so well received that a benefactor donated the funds to take the show to the Teatro Rubén Darío in Managua, Nicaragua. This was the first public exhibition of art since the end of the Nicaraguan revolution and its arrival evoked deep patriotic emotions in a country that had hidden its artistic side for almost 15 years. After 6 years of directing the gallery at MAM|FA, Sofia moved to Miami, Florida to become our regional associate. With MAM|FA she continues to work with collectors of Latin American art and to develop new business in the South Florida area. She focuses on consulting with new collectors who are building important Latin American collections as well on continuing to assist established clientele with selling works and receiving consignments. Lynn created and maintains MAM|FA’s database system. Lynn graduated from Columbia University in 1980 with a degree in Economics and did graduate work at the Columbia School of Business in Operations Research.